Meet American Girl's 2019 Girl of the Year in this original novel! My daughter and I look forward to the unveiling of the new Girl of the Year Doll. We try to guess what her aspiration and hobby might be. We were disappointed when we first heard about Blaire. She’s an aspiring chef, which is wonderful, but in the AG catalogue, instead of having a hobby or a defined passion, she’s helping plan a wedding on her family farm. We decided to check out Blaire’s book to find out what we were missing. As it turns out, we were instantly hooked on the story and read it together. Blaire’s family runs a Bed & Breakfast with a Farm-to-Table restaurant. We enjoyed learning about how all the food served at Blaire’s restaurant was harvested on their family farm, or a farm in the same area. Blaire and her mother write blog posts for their family website with recipes that they create together. Blaire thoughtfully takes photos for the website posts too. This is all wonderful and heartwarming. One topic highlighted about Blaire is her excessive use of screen time. She’s always on a computer, pad or phone. It’s interesting how it was laced into the story, because it never felt like these were “here-comes-the-lesson” moments. Another topic explored is Blaire’s newly diagnosed allergy to dairy. This affects her deeply and it was well done in the story. Blaire’s parents have decided to renovate the main barn on their property to be used for weddings and parties. Her grandfather is not happy about it, and Blaire overhears him tell someone he sometimes wants to retire and move away. Blaire is so worried, she vows that she can prove to him that the renovations are a good decision. This barn is such a source of stress though-out the book. The 28-year-old farm manager, Cat is like a big sister to Blaire. Cat’s boyfriend asks Blaire to help him propose. Blaire tells herself if she comes up with the perfect plan, Cat will say yes. (So much pressure for a little girl!) Not only does Cat say yes, she decides that Blaire can plan her wedding and Cat’s boyfriend agrees saying that Blaire can run interface with his mother who also wants to help. He literally says, “…that does sound like the perfect way to handle my mother.” BLAIRE IS A 10-YEAR-OLD! Give the girl a break! As the story continues, there is event after event where Blaire takes it upon herself to make sure she does the right things so adults will get what they want and they will be happy. Poor girl is so riddled with anxiety trying to people please her way through the world. We really liked Blaire and we couldn’t put the book down. 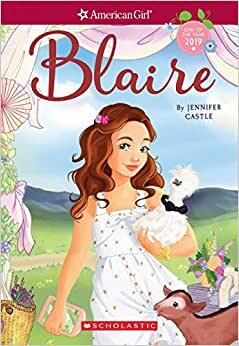 Overall, I had mixed feelings about Blaire’s story. I give it 5 Stars for the writing and 3 Stars for the story, for an average of 4 Stars. I would read this author again. She did an amazing job with the parameters American Girl set for Blaire. To American Girl, you guys should know that people pleasing is not a hobby. My granddaughters love Blaine’s story. She lives on a farm where they don’t use pesticides. Also she needs to but dairy free just like my granddaughters. This is an Up to date story that is still super cute with lots of animals and a smart, fun little girl! Loved reading this book alone and with my daughter. A delightfully fun story with many good lessons and values. Bravo AG! Keep them coming! We hope the movie follows? !